Most new parents understand the importance of baby proofing and invest a lot of time trying to keep their kids from getting into trouble. They know their toddler will climb things, grab dangerous materials and chuck anything they can lay their hands on into their mouths. They also know that they can keep the toddlers relatively safe by covering up things that they can hurt themselves with, keeping them in safe places, keeping things that are dangerous out of their reach and watching them closely. However, this isn’t always enough. We live in a device driven period so some of the usual standard baby-proofing methods won’t be adequate to protect your child. Look around you and you’ll find gadgets, TVs, tablet devices, chargers, etc. that litter your home. This means that even though the classic baby proofing methods are still important, you need to know some modern methods as well. Cords are part of our daily lives so it is common to see chargers and USB cables lying around the house. This is very dangerous with children around. You need to make sure the chargers are placed high enough out of reach. Do the same for your power extension cords. Make sure that they are hidden either on top or behind your furniture to avoid your kids touching them and getting a shock. Some homes have beautiful, costly furniture. Some have some industrial quality furniture as well, to further add to the beauty of the home. Imagine having your lovely Industrial Furniture by housejunkie.co.uk getting defaced by your child or having it fall on your child after it tipped over! Not a nice thought. It is important to make sure they are properly secured with wall restraints. Don’t forget to use some sofa covers as well. A throw will do. No need shelling out money on custom fitted covers. Flat screens can be placed on any surface in the home these days. This can be a big problem for people with kids who will invariably attempt to climb up and grab the TV. You have to make sure your TV is bracketed down to avoid them bringing it down with a crash. Even very young kids can topple a tv, so make sure you get your TVs secured while they are young. 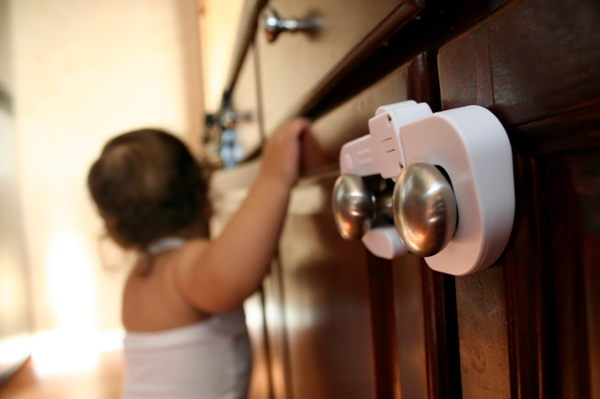 A standard baby proofing practice is to plug in covers in all the electrical sockets in the house. However, these covers can be hard to remove when you need to use them the most. There is also a choking risk when you have them off and don’t put them away properly. This is why you should use outlet covers that have sliding doors. This will give you instant access to your outlets when you need to use them, and, since you never have to remove them, you don’t have to worry about them ending up in little mouths. Instead of classic audio-only monitors, many parents now use new, high-tech video monitors. While these are very nice to have around, don’t forget that the cords can also pose danger to young children. So it’s either you ditch the wired ones or make sure the cords can’t be reached. It is very easy to leave leads and cables lying around, or to forget to secure a TV. Take a look around your home and do a risk assessment. If you do a comprehensive review of the dangers in each rom you will be able to relax a lot more when your kids are on the floor. This entry was posted in Family and tagged baby, home, proofing.